Barnacle Goose, belonging to the duck family, has similarity to the Canada goose. It is a water bird that belongs to the family of Anatidae. They are not huge instead they are medium sized. They have black plumage and have very attractive looks. People from various countries, flock to areas where they migrate during winters to view these spectacular birds. The Barnacle Goose has a host of other names as well. The goose of this species has an eye catching appearance. Size: This bird is medium sized. The size varies around 55 to 70 cm. Both males and females look alike in form, but males are usually larger. Color: The color of the face is creamy white. The neck, head and breast is black colored. The back is a combination of blue and black. The wings and its back are silver and grey in color. It has black and white bars. The tail, feet, bills and legs are black in color. The side portions and flanks are pale grey. Weight: The weight of their body varies from 1.21 to 2.23 kg. Wingspan: The wingspan of this bird species stretches from 130 to 145 cm. Beak: Barnacle Goose has little triangular shaped black colored beak. Body: The head is round and the bill is short in size. They are mainly found in Western Scotland and Western coastal area of Ireland. They breed in Russia and Greenland during the winters. Apart from these areas it is also found in Sweden, Bulgaria, Czech Republic, Latvia, Great Britain, Netherlands, Slovenia, Serbia, Belarus, Romania, Estonia, Germany, Belgium, France, Hungary, Iceland, Spain, Switzerland, Poland, Canada and some other European nations. The Barnacle geese of Greenland migrate to Ireland and in some areas of Scotland in winter. The Russian population winters in the Netherlands and Germany. They migrate to countries like Britain and Ireland during the months of winter, to get away from the harsher climates. Its habitat is Wetland meadows, marshy area and river. They dwell in farmlands, lakes, ponds, taiga, broadleaf forest area, coniferous forest, temperate grasslands and tundra region. The Barnacle Goose is herbivorous. They feed on seeds, leaves, coastal plants roots, stems, grasses and shoots. Here are some of the behavioral patterns of this attractive species of birds. Barnacle Goose is sociable. Outside the breeding season these geese are very outgoing. They usually love to fly in packs in long lines with barking. They are monogamous by nature. 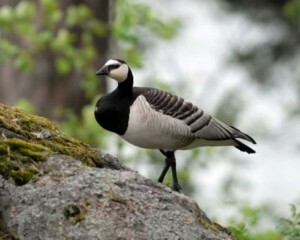 Barnacle Goose is a migratory bird. Barnacle Goose is attacked by Arctic foxes and polar bears. Here are some of the special adaptive features of this species of goose. They are adapted to flying. They fly in packs and that helps them in preventing attacks by their predators. The Barnacle Goose flies in V-shaped wing formation with white patch on rump along with silvery grey colored under wings. In flight the wings look very wide. The call of these geese is unpleasantly loud and harsh. Their sound follows very quickly. When in group, they have a high pitched “hogoog hogoog” kind of mixed calls. The call resembles barking of a pack of dogs. During the display of courtships, the couples bound, widening their neck and flapping their wings. They call very loudly. Every bird selects its partner for the season. They are serially monogamous. They are available near the breeding grounds from the months of May to June or till August or the month of September. They breed in the high cliffs of the North Atlantic Arctic Islands of East Greenland, Spitsbergen, and Northern Russia. 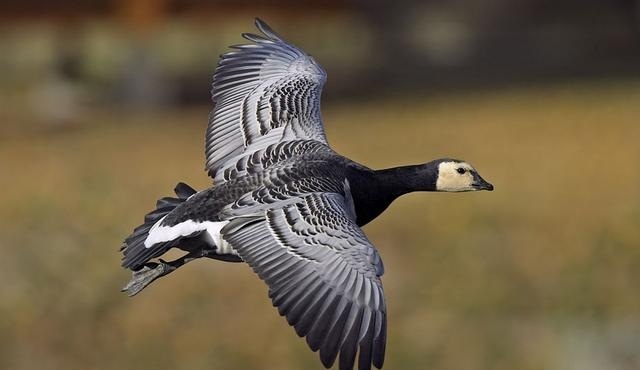 Barnacle geese breed along the north eastern coast of Greenland, Svalbard, Norway and Russia. These species of birds nest in small colonies among rocky areas or on cliffs and islands. They lay an average of four to six eggs. The Size of their egg is around 77 x 50 mm. The weight of the egg is 107.0 g approximately. The incubation period is usually of twenty four to twenty five days and is done by the female. The females feed, care and rear the young birds for somewhat around forty to forty five days. The young geese are away from their food. When they are merely 3 days old, the newly hatched goslings jump from the high boundary and fall to the rocks underneath. The small size and feathery bodies protects them from falling down. Sometimes they are injured and are unable to fly. The goslings then live with the adults and shift into the valleys in search for fresh food. The goslings must feed endlessly over the next months so that they have an adequate amount of food supply for the long flight to Ireland during the winters. Like all geese, the gosling are not fed by the adults, instead when they are three days old they are brought by their parents to feed for themselves from fresh green vegetation. The parents undergo flightless moult period which lasts for three to four weeks. The average life span of this stunning bird is twelve years. These bird species are listed as “Least Concern” by the IUCN. Here are some of the incredible facts of this beautiful bird. 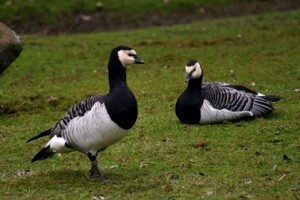 The history of Barnacle Goose is bounded with myth, which claims that they were born of driftwood. The maximum recorded age of a Barnacle Gosse was twenty six years and eight months. Barnacle Geese are protected in Ireland which is why numbers have been rising in recent years. It was believed earlier that Barnacle Geese are a type of fish that were born on old timber at the base of the sea. They were regarded as fish and could be eaten on Hold Days and during Lent. 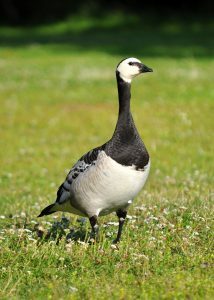 The name Barnacle Goose and the scientific name of the Brent Goose come from the parable that Barnacle Geese were produced from barnacles. 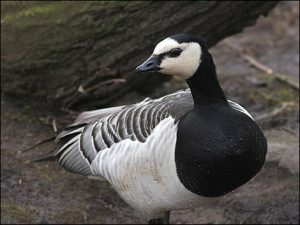 Here are some pictures of this attractive Barnacle Goose.